Not one, not two, but THREE articles were posted on the UK-based Guardian website Sunday obsessing about Freemasonry. Just as you'd guess they would, they managed to jam in a reference to handshakes AND "rolled up trouser legs," along with rattling Roberto Calvi's mouldering bones from 36 years ago as part of their very deep background. Even the aging Martin Short got dragged out of retirement as the late anti-Masonic wingnut Stephen Knight's intrepid standard-bearer once again. It was like a trip down memory lane, analagous to listening to a radio station replaying nothing but old Peter Noone singles—the journalism equivalent of the brain cell-destroying guitar riff in 'Mrs. Brown You've Got a Lovely Daughter.' It would merely be tiresome if it weren't for the insidious repetitiveness of it. No surprise, really, as all three pieces were authored by the same Guardian reporter, Ian Cobain. Here's a sampling, but follow the links for the full effect. Two Freemasons’ lodges set up for members of parliament and political journalists are continuing to operate secretly at Westminster, the Guardian has learned. One gets the very peculiar feeling that what really irked Cobain was that there weren't any Guardian members he could discover as members of those lodges (or who would admit it to him, at least, because why would they?). It reads like the unfilmed introduction to the old Monty Python 'Architect' sketch. ("And your bleeding Masonic handshakes! You wouldn't let me join would you, ya black-balling bastards? !...Oh please, if you could put in a word for me, I'd love to be a Freemason!...I've got a second-hand apron...I nearly got in at Hendon..."). I don't know myself, but perhaps it's just because that particular lodge's members who are journalists don't regard The Guardian as journalism. But I digress. But don't miss the billboarded "Guardian Graphic" illustration of the "secret handshake." This keeps poor anti-Masons up all night long in cold sweats just contemplating it, so they take opportunities just like this to "expose the secret" with the same sort of childlike glee a three year old has when he discovers he can make a fart noise with his tongue to annoy the adults. The secret society is still pretty secret, and recent claims have reawakened long-held suspicions over its influence in public life. 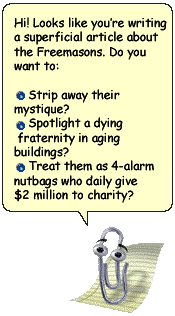 The often-repeated message has been that Freemasonry in the 21st century should not be seen as a mysterious and clandestine affair. The unspoken message has been that the wider public has nothing to fear. Then on New Year’s Eve, the outgoing chair of the Police Federation, Steve White, tossed a hand grenade into this carefully crafted reputation management operation, with an allegation that Freemasons were blocking reforms in policing and thwarting the progress of women and officers from black and minority ethnic communities. Only because bird cage liner rag sheets like The Guardian made sure to remind them of paranoid, unproved ALLEGATIONS from 30 or more years ago that countless expensive investigations failed to substantiate in any way. And that the FORMER head of the Police Federation on his way out the door this year decided to blame "secret" Freemasons, of all things, in his own organization's ranks for giving him the Order of the Boot. And certainly not through any failure on his own part. Finally, there was this third little entry that is apparently intended as a very brief guide. During some periods of history, Freemasons have been persecuted – by the Nazis, for example – and have needed to go underground to survive. 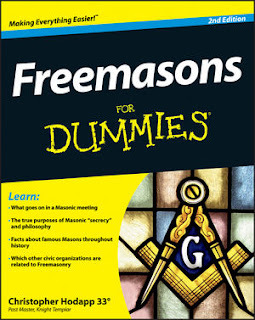 But there are persistent suspicions that Freemasons also remain secretive in order to conceal the way in which they can assist each other in business and the workplace. Is there any substance to these claims? No details, or even a link to that story from 23 years ago, of course. No explanations as to why the two men were assaulted or arrested, what did or did not transpire, and no certainly acknowledgement that ANY organization can have jackasses in it, regardless of its lofty stated goals. Why, even a news organization can be susceptible. It's been standard procedure in the UK press for three decades now to gleefully tout when a miscreant, misbehaver, or criminal happens to be a Freemason, that becomes the headline. Not whether he's a Manchester United fan, or a stamp collector, or a front pew-sitter in the local Anglican church, or a member of the Communist Party of England. No, it's only someone's Masonic membership that gets trotted out and brandished like a clap-trap reprise in a bad music hall act. Longtime UGLE Director of Communications John Hamill wrote a very long description of the post-1984 open attacks against Freemasonry back in 2000 (read it HERE), and details the sort of discrimination against the hiring of Masons that went on back then. This is exactly the sort of thing that The Guardian and many others seem to want to return to once again. A decade of Mason hunting by the Home Secretary Jack Straw went down in flames in 2009 when the European Court of Human Rights declared the singling out of Freemasonry for public excoriation without proof to be in violation of EU laws. 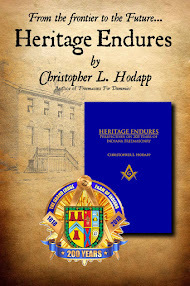 England was forced to finally drop their regulations that demanded all members of the police and judiciary publicly reveal their Masonic memberships simply because of the PERCEPTION of POTENTIAL wrongdoing. The Guardian knows this, since they themselves printed the story. For as long as I've been reading stories like this there has been a strange dichotomy in the anti-Masonic tactics used by the English press. On the one hand, the Freemasons are continually brayed about as being dangerous, "dodgy," too influential, too "secretive," and in general, constantly covering up for members' bad behavior. 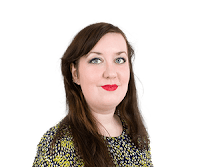 Of course, you would be damned secretive too, if the hostile and sensationalistic press had turned public opinion so deliberately against you that just acknowledging your membership could endanger your job, your friendships, or your public reputation simply because of the imaginary horrors outsiders have created. Yet on the other hand, the press there goes on and on about how anachronistic, archaic, un-prestigious, useless, and downright silly the fraternity is these days, and how much membership in England has plummeted (a situation the press has openly helped to stoke themselves). They can't have it both ways. Either we're all-powerful and nefarious, or we're useless and impotent. Which is it? Because the simple truth—that Freemasonry is exactly what it has always claimed to be all along—just doesn't sell newspapers or even make good click-bait. In other European news, the Italians are ramping up their anti-Masonic auto-da-fé hearings, once again trotting out their own favorite claim, that Masonic lodges are really just safe-spaces for Mafiosi. Oh come now. 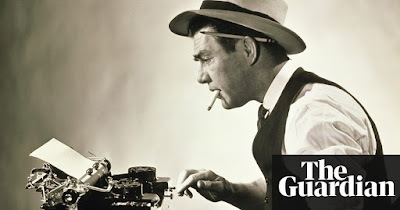 A FOURTH sniping Masonic article in the Guardian in just two days? They're seriously taking on the characteristics of a teenaged stalker at this point. I just hope no one took actual money for this last one. That would be theft. Aaaaaand a FIFTH one on the second day, this one an editorial. And a damned ignorant and ill-informed one, by a female and a Catholic to boot, who quite openly declares that she therefore has TWO major chips on her shoulder. Once again, dragging up ancient allegations and hearsay from decades ago when the UGLE had 350,000 members and nearly 10,000 lodges. They were inflated INCREDIBLY out of proportion ("Well, the fellow's whole body language changed after I gave him the handshake...") and made sensational and even scandalous in their time by the press, and now get dusted off as fresh fodder for these retreads. The Guardian has decided to go all in on Mason bashing this week. And no wonder—they've started opening up articles on their websites for comments recently, and the Mason-related ones in the last two days have gotten hundreds of posted comments in response. Of course, the UGLE's millions and millions of pounds raised for public charities never come up in these hit pieces, unless as a casual aside (and usually immediately followed by a "But critics say...") then the smacks continue. Fortunately, attitudes about these kinds of press attacks have taken a dramatic change over at Great Queen Street. Dr. David Staples, the recently named Chief Operating Officer for the United Grand Lodge of England has been extremely proactive in answering these stories. And whether the news outlet prints them or not, he's posting them on the UGLE's website as well, so they can be searched and accessed in their entirety. His most recent letter to the Guardian can be seen HERE. Quietly we watch in astonishment as we are demonized by those who would return us to the day of superstition and inquisition style trial by mob. All the while none of this would be possible save it were for the closed door freedoms of expression found in those old tyled lodge rooms. The church and aristocracy would have not allowed it. Thus, the press attacks free assemblage, wanting for some proof that the ills of society are not some how their own responsibility or doing. Just canceled my Guardian 'membership.' I certainly don't want my money supporting this kind of nonsense. Take note that a rise in FM bashing goes hand in hand with a marked rise in anti -Semitism. Remember Hitler dealt with FM before turning his full attention to the Jews. IMO such anti - Masonry has to be immediately challenged by very good PR presentations carried out by ppersons who are known by the wide public. Very true. This was starkly demonstrated last year in Paris when the Grand Master of the Grand Orient of France was attacked as he left their headquarters on Rue Cadet. A woman saw him exit, ran up behind him, and struck him in the head with a hammer, while shouting, "JEW!"